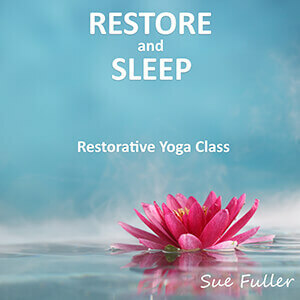 Restore and Sleep is a 60 minute guided restorative yoga session created specifically to release stored tension, still your mind and induce a state of deep relaxation making it easy for you to drift off into a great nights' sleep. When you wake you will continue to enjoy the benefits of this session, no matter what your day brings. In this restorative yoga session the poses are held whilst the body is comfortable and supported. Your body will not be pushed beyond its natural range of movement. The Restore and Sleep session is devised and guided by Sue Fuller and was recorded in a professional sound studio. Sue is a regular columnist for the Yoga Magazine, the resident yoga expert for Natural Health Magazine and a leading yoga teacher, writer and training course author who has studied and taught yoga around the world since 1995.